This accommodation used to be the traditional 2 floors house of my grand parents which i have just renovated to 2 big apartments this year again . If you are looking for a real , local Greek experience this is your place to stay . The apartment is an independent private residence. Our guests are mostly adventurer travellers and families who seek for genuine experiences and want to blend in with the local culture . Located in the heart of the traditional settlement of Fira Capital ,this apartment has 2 separate rooms and can host up to 4 persons . The main bedroom has a king size double bed , television , mini hi fi with CD - AUX - USB player . If you are more than 2 guests you can use a big sofa in the second room which can be easily transformed to a normal big size double bed .An extra bed can also be provided . The second room is also equipped with a private W.C. and shower .That is really convenient as there is complete privacy for both rooms of the apartment and will give you the opportunity to visit with your friends or family without having to split in 2 different properties .Meaning , you can all share the costs as a place for 4 guests is much cheaper than 2 typical double rooms in a Hotel . The kitchen is fully equipped with Big Oven , Microwave and Large Refrigerator . The balcony has a wide view overlooking the east part of the island & sea and is very sunny for the entire day time . Wi - Fi fast internet connection is also available ..
i advise this property for people who want to feel like home wherever they travel in the world . If you are looking for a a kind of a typical hotel accommodation service this place is not for you . In this apartment you will wake up by the bright sun shining from the big east windows , cook a breakfast with fresh local products you bought from the grocery shop next door and set off for your adventure in Santorini . Come back after sunset take a nice hot shower and make a nice meal or cocktail to stay in the balcony overlooking Fira town or get prepared to go out for a romantic dinner or party till early morning . This apartment is one among the really few lodgings that exist in Fira town central and can give a ''like home'' feeling to your stay away from big hotel blocks . Furthermore , this apartment can host up to 4 people with their own private bathroom and shower sharing only the kitchen .That gives you the opportunity to visit with your friends or family without having to split in 2 different properties . 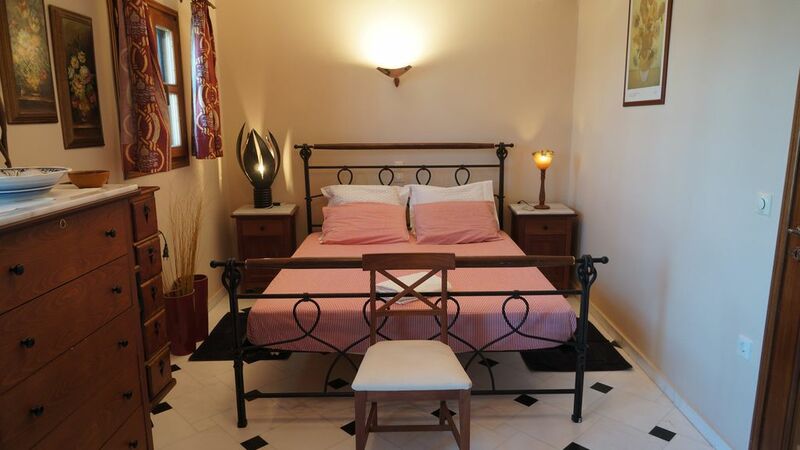 Also , you can all share the costs as this place for 4 guests is much cheaper than 2 typical double rooms in a Hotel . The kitchen is fully equipped with Big Oven , ceramic glass cooktop , Microwave , coffee maker and Large Refrigerator . the balcony is overlooking the east side of the island and the aegean sea . It is fully sunny for the entire day time . We enjoyed our stay at this clean and comfortable apartment in the center of everything. Beautiful views, convenient to shops and restaurants. The bus and taxi stations are a short walk and easy to get around the whole island. Great balcony and spacious patio with table and chairs. A wonderful visit! Thank you! Amazing property, clean,great view to almost all island ,in the center of the center!we just loved it! We loved having two bathrooms , very unique decoration,comfortable king size bed ,balcony with great views and amazing entrance! We had a perfect vacation break,weather was good ,locals are very kind and believe me, Santorini is magical! Recommend to everyone,this house is 5 star!